NO BEANS WERE CONSUMED IN THE MAKING OF THIS CHILI! 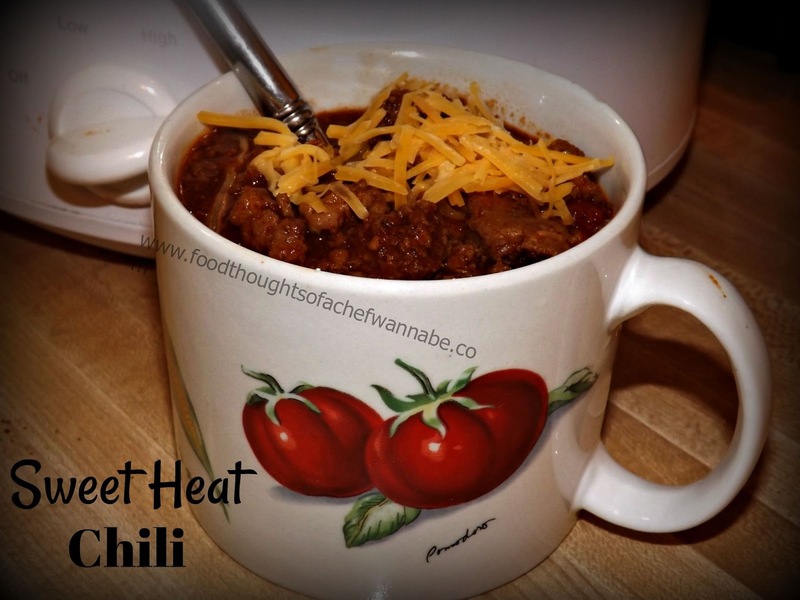 How long have I been blogging now and I have never shared my recipe for chili? Everyone it seems has their "famous" chili recipe or "makes the best chili". Well, yeah.....that has never been an issue for me. It has taken me years to perfect how we like our chili. Even then, it was sometimes not the same as the last time. No consistency, always a crap shoot. I finally nailed it down, wrote it down, and got it right, for GOOD! This is a sweat chili with a good amount of heat. Heat, as always, can be adjusted to your preference. The sweet isn't overwhelming but definitely there. I worked my sweetness so many ways sugar, honey, agave, and you know, nothing does it like the corn syrup. So there you go. If you happen to go a little over the amount on the recipe, no worries, just makes it better! My husband will add in a couple of Thai chilies to his, but, that is how he rolls. Let me get you started, to me, in this recipe, the order of the ingredients seems important. I don't know why, please don't ask, because I have no sane explanation, it just seems that way! Brown your ground meats. If it renders a lot of fat, drain it, if not, no worries. And in your red pepper flakes. Let cook for a minute while stirring. Wake those babies up! Add in soup, diced tomatoes, onion powder, cumin, chili powder, salt, and black pepper. Stir to combine and let simmer for abut 15 minutes. Add in light corn syrup, and make those tablespoons heaping! Adjust to your taste adding more if you want. Stir and simmer on low for another 30 minutes. If you are using a slow cooker, just put your browned meet and peppers in the slow cooker, add all other ingredients except corn syrup. Cook on low for 4 hours, and add corn syrup in about 30 minutes before serving. Obviously you can adjust the sweet or heat to your taste, this is how we do it, and sometimes end up adding more heat to individual bowls. Don't forget the cheddar cheese on top! PS. If you prefer a thinner chili, please feel free to add water or beef stock!If you groove on beans, (erp) add those too! HAHAHA!! You go for it and let me know how you like it!